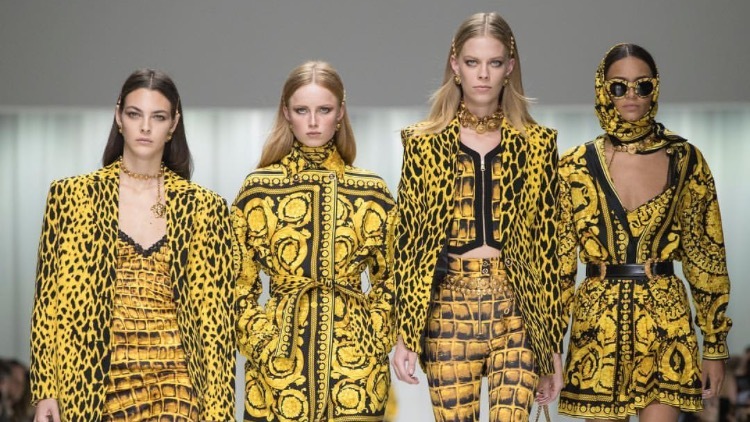 So it’s all over the internet anyways but can we just talk about how Versace not only won Milan Fashionweek with the tribute to Gianni Versace, but also won everyone’s heart? Just a few but heart melting self-recorded words from Donatella, that were part of the sound all the models walked to while they were rocking the runway. It’s safe to say that there wasn’t a dry eye at today’s fashion show which was also the perfect occasion for Donatella Versace to mark the 20th death anniversary of her beloved brother Gianni Versace, who was munseres in Miami. On the runway we saw the most iconic revived creations of Gianni to underline the words the ‘celebration of an icon’. The runway models were presenting these iconic looks in squads like back in the 90s walking together side by side. Besides Kendall Jenner, Vittoria Ceretti and many more, of course Kaia Gerber stunned in her looks on the runway. She surely got it from her mama and the Versace show was the first time to share the runway with mom Cindy Crawford, who made an appeareance together with the OG’s for the finale: Carla Bruni, Naomi Campbell, Claudia Schiffer and of course Helena Christensen walking hand in hand giving the new generation a lesson on how it’s done. Sometimes it’s gotta be about the supers. The internet is losing it and so am I. These queens are part of my younger days and to me they are kind of legends. It’s about time that the younger generation gets a taste of the good old days. It’s safe to say that this show will for sure mark an important day in fashion history. Brb. Taking a closer look at all the runway looks now.